This exhilarating production celebrates the colorful New York neighborhood of Washington Heights and has been thrilling Broadway audiences since its opening in 2007 with its message of hope and self discovery. With an exuberant score infused with salsa, merengue, hip hop, and pop, the production won the 2008 Tony Award for Best Musical. 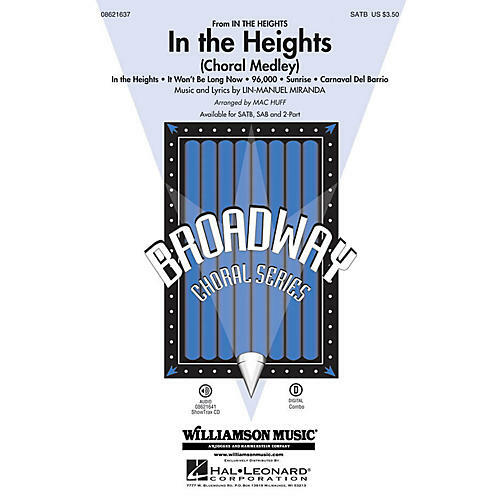 Songs in this 13-minute medley include: In the Heights, It Won't Be Long Now, 96,000, Sunrise, Carnaval Del Barrio. Available separately: SATB, SAB, 2-Part, ShowTrax CD. Combo parts available digitally (tpt 1, tpt 2, tsx/fl, tbn, btbn, syn, gtr, b, dm, perc). Duration: ca. 13:20.